Day 1: The action got started for the women on Friday in the Soul Bowl, a giant structure built right in the middle of the beach. This thing is not sized down for the girls – the twelve-foot bowl required a ladder to climb out of. The twelve women competing ranged in age from 12 to 30-something and included every one from legends such as Cara-Beth Burnside to newcomers like Alysha Bergado. Each woman was given an intro run and then it was free for all in the form of a twenty-minute jam session. This format gives the girls the chance to try some tricks they might otherwise not be able to pull off in a traditional timed run format and it paid off. Brazilian skater Karen Jonz nailed a few shuv-it combinations before stepping up to a heelflip indy. The local girl, Julie Kinstrand took a gnarly slam about halfway through the contest, but got back up to ollie over the exit ladder in just a few tries. Former young gun Lyn-Z Adams Hawkins linked together multiple invert variations, but wasn’t able to stick the illusive frontside invert, which would have scored high with the judges. 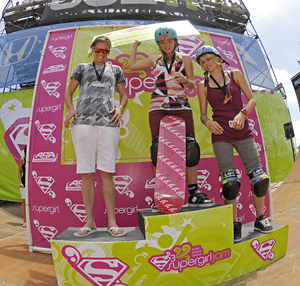 Topping the podium was Mimi Knoop, who skated with the expert consistency that only comes with years of practice. Moves like boneless airs and a fast plant scored high, and coupled with her solid airs, grinds and use of the entire bowl she nabbed a high enough score to take home the top prize of $3500. Though the bowl jam concluded early in the afternoon, the day was by no means over. In addition to the bowl, a full street course has also been built on the beach. Although the pros won’t compete until tomorrow, today the set up served another purpose. Open clinics were held where some of the potential s pros of tomorrow got tips from experts. If you weren’t lucky enough to make it out, be sure to check out tips from Lyn-Z Adams Hawkins on how to get started skating. Day 2: It was an action-packed day second day at the S3 Supergirl Jam in Huntington Beach. Things started off with Skateboard Street Prelims, where Lauren Perkins qualified on top for Sunday’s final. Then the skating moved over to the vert ramp for the Vert Best Trick Contest. 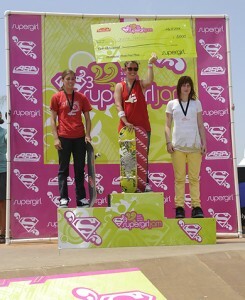 The top ladies in the world battled it out and Brazilian Karen Jonz nailed a nollie pop shuv to win. The action concluded with the Inline Rail Jam, a best trick competition. Inline Skating’s best women were on hand to throw themselves skillfully down the rail and they did not hold back. One of the rowdiest crowds of the day hooted and hollered as the girls either negotiated the rails successfully or crashed even more dramatically. Fallon Heffernan definitely earned the heart award, trying to jump over the rail and land backwards, crashing and again and again. But, as the announcer said, they can’t give an award for heart. Luckily she landed a Backside Top Acid to Backside Royale early on that earned her third place. In second was Martina Svobodova of Slovakia. She crossed the pond to nail a True Spin Topside Royale. First place went to Chynna Weirstall. The youngest competitor of the day at just 16, this was Chynna’s first pro event. After several impressive tricks, she nailed a Unity Step Acid to take top honors. Day 3: The Skate Street finals saw some of the best action women’s street skating has to offer. Lipslides, 360 flips, and even a bluntslide down the rail were all thrown down by the talented field. Six women from the qualifiers (unfortunately Tamara Drybrough had to sit out with an injured foot) joined the top five skaters from last year. After everyone had their intro run, it was two five minute jam sessions to determine the winner. Evelien Boulart from Belguim skated incredible in the jam session, nailing a back lip, frontside bluntslide, feeble grind down the big ledge and almost stuck a kickflip backlip. Though she had the highest score in the jam session, she’d had trouble in her intro run, so her combined score earned her third. She did however win an extra $1000 for her bluntslide, which won best trick. In second place was Rachel Reinhard who was backside flipping the hip, kickflipped and shuved the five-set and lipslid the rail with ease. Taking home top honors, though, was local girl Lauren Perkins. Lauren’s flawless intro run garnered her the highest score of the day, a 79. Then in the jam she skated solid and consistent to bring home $5000. “It was so cool, my family and friends were all here cheering me on, so it was definitely nice to win at home,” Lauren said.